If your home’s garage door system isn’t working properly, we can help. There are lots of different problems that can develop with the typical door system, and our technicians have seen everything, from broken torsion springs to dented tracks and malfunctioning openers, our team can provide the fast, reliable solution you need. The opener is the most complex element in a door system, and one of the most common problems we see is drive system failure. Belts can tear, chains can come loose, and when this happens it often makes your door inconvenient if not impossible to use. Thanks to our in-depth experience when it comes to working with all kinds of different opener units on the market, our team will be able to pinpoint the root cause of the issue, and provide a solution. If a new chain or belt is needed, we’ll be able to supply a trustworthy replacement. Your springs are essential parts of your garage door system. These tough, high-strength components are designed to withstand the enormous pressure of lifting a 150+ pound door day after day. They won’t last forever, though, and will eventually weaken and wear out, or even break completely. These components can be dangerous to replace, but our technicians know how to safely secure your door before disconnecting and replacing the worn-out units. Garage door panels can be damaged more easily than you think - a scrape from a car, or even an attempted break-in can be enough to severely damage a steel, plastic or aluminum panel. Our team can remove dents and repair minor damage, but heavily damaged panels might require a replacement. In this case, our team will provide a new panel, and safely extract the damaged unit from the door. We offer all the repair services you could need. We also provide emergency appointments, so you won't have to wait long for a technician. Call us today at Garage Door Repair San Ramon! Why is it my garage door opens a little then stops? This type of malfunction usually means that either there's an issue involving the tracks, or the automatic garage door opener travel limit switch needs adjustment. 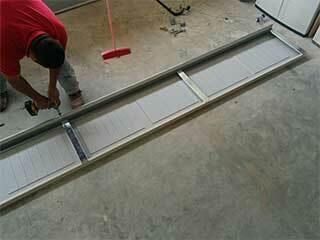 Track issues mean that some sections are bent or blocked, and the garage door rollers can go through. If you can remove the blockage carefully that's fine, but as for garage door track repair, it's best that you leave this to an expert. If the garage door opener travel limit needs to be readjusted, you can consult your owner's manual on how to do this. Some LiftMaster and Chamberlain models have up and down keys for that. Alternatively, you can give us a call and have an expert service technician assist you with this. Unfortunately, we're going to need some more information to answer this question. There's a whole slew of potential issues that can cause a garage door to fail to open. From electric opener problems to broken springs and all sorts of track and roller problems. Figuring out what's wrong with a garage door can require experience and technical skills, so be sure to give us a call whenever you find yourself in need of some expert assistance.